Magic's new set is available in stores! The Golden City of Orazca has been found! Build your forces with new Vampires, Merfolk, Pirates and Dinosaurs to gain the city's blessing! Purchase an Ixalan booster box in-store and receive a special 9 card booster pack, and a limited edition promo card! Brave the Unknown! Ixalan features double-faced cards! 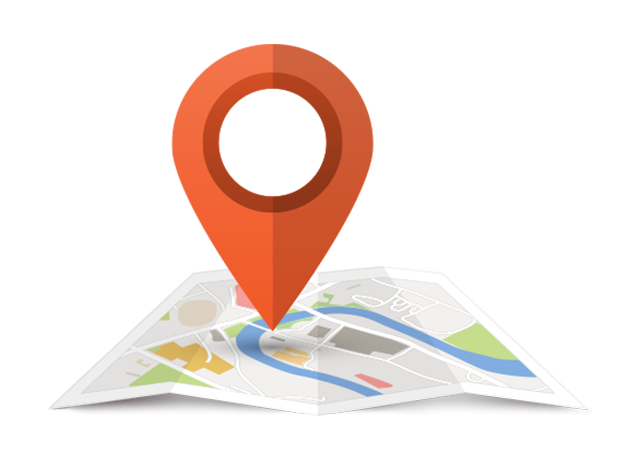 Accomplish the goal on the front and they transform into an iconic land! Infinite Jace planeswalkers! Infinite Dinosaurs! Ixalan features three brand-new planeswalker cards, including the introduction of Huatli! When the Dinosaurs of Ixalan take damage, enrage triggers! You do not want to make Dinosaurs angry. Unimaginable amounts of Treasure to be gained! Ixalan features treasure-loving Pirates! And what would Pirates be without their pirate ships? Raid returns to Magic! First attack your opponents, then your Pirates will plunder! Who better to help you explore the lush jungles of Ixalan than the Merfolk tribe? With explore, you are rewarded with either an additional land or a bigger Merfolk! For centuries, the untamed jungles of Ixalan have hidden a coveted secret: Orazca, the city of gold. Unfurl your sails, saddle up a Dinosaur, and battle your rivals as you embark on a journey to claim the plane's greatest fortune for yourself! The Deck Builder's Toolkit puts 285 cards at your disposal, with everything you need to create multiple Magic decks. No two toolkits are the same. Learn to build your best deck! Experience all of Ixalan on your PC. Play Draft, Leagues, or all of your favorite Magic formats. Join a League in stores or create one at home! 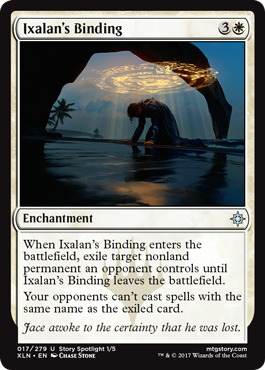 Have a blast with a booster draft event featuring Magic: the Gathering's latest release, Ixalan! Play new cards for the first time with other Magic players who enjoy the game just as much as you! Show up, get a free Welcome Deck, and play Magic against other newer players! A man wakes up alone on an island, his memory as absent as his means of arrival. Huatli is a Warrior-Poet of the Sun Empire. Her talent in combat and creativity know no bounds, but when faced with a frightening encounter and an even more astounding vision, she must overcome discomfort to live up to expectation. 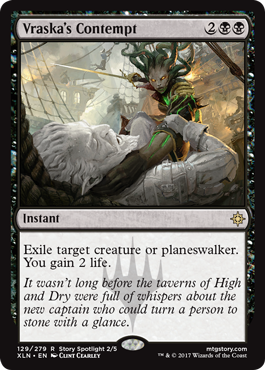 Vraska has never been happier. Finally able to be the leader she always knew she could be, she captains The Belligerent with the skill of the greatest of commanders. She had kept Jace Beleren alive initially to utilize his talents, but soon discovers that they make quite the team. With so many different groups seeking the golden city of Orazca, how will the River Heralds keep the city's power from falling into the wrong hands? 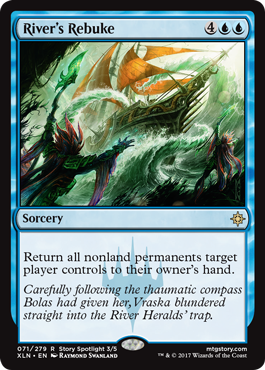 The Belligerent harbors at High and Dry, and Jace gets the lowdown on Vraska's mission. 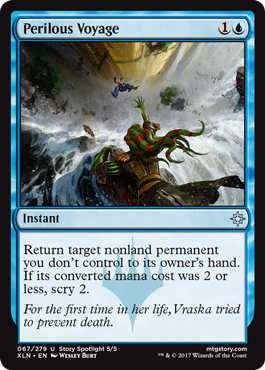 After the River Heralds marooned The Belligerent, Jace and Vraska escape intact. Meanwhile, Huatli and Tishana team up to track down the compass that could lead them to the Golden City, and Vona pursues. The race to the Golden City picks up the pace as each group jostles for position. 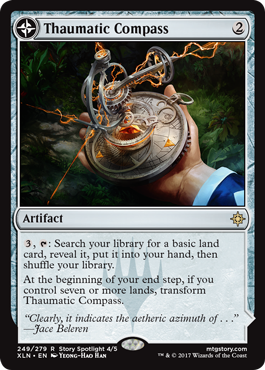 Everyone needs the Thaumatic Compass to reach the city, but who will get there first?